← Golborne before Trellick Tower. Gwen Nelson (nee Martin) recalls the 1950s and 1960s. OS map 1935 of Golborne Road north east of the iron railway bridge towards Kensal Road. All the buildings shown were demolished. Trellick Tower was built on the land on the east side of Golborne Road including Southam Street and Edenham Street as shown here. To say North Kensington in the 1950s and 60s was a rough area would be a gross understatement. It was an out and out working class area and had been ever since it was turned from farmland to residential in the mid C19th. 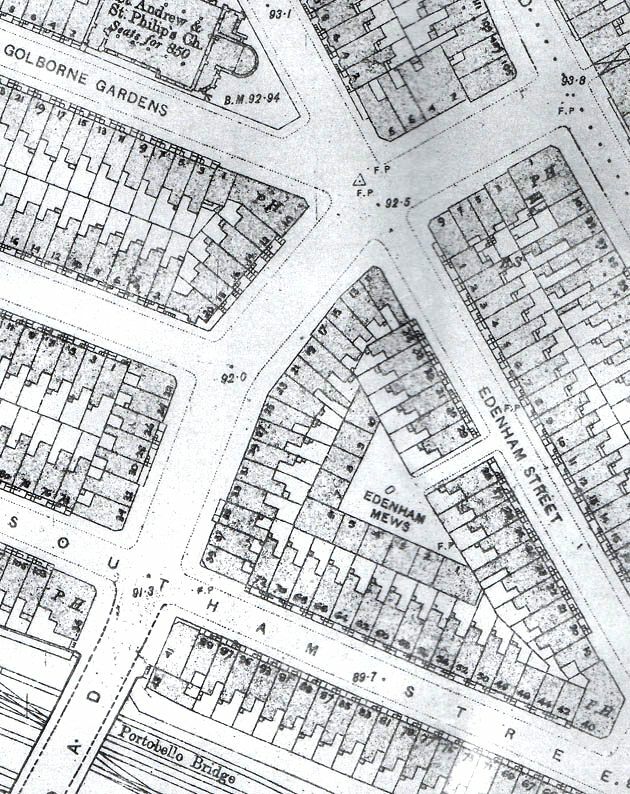 I believe the original plan was for quality housing for a rising, prosperous middle class but somehow this never materialised, at least not to the east of Ladbroke Grove where the large houses and accommodation over the shops on Golborne Road were rented out by the floor or room with shared conveniences for all tenants. When we moved to Golborne Rd in 1952 I was six and knew nothing of its history or reputation. It was only some sixty years later, when researching my family history, that I discovered my family’s links with Golborne Road went back far further than we knew. I was born in St Albans in 1946. One of those curious quirks that resulted from expectant mothers being sent to makeshift maternity homes in the country as the main London hospitals were commandeered for returned servicemen. I was born in Diocesan House, once home of the Bishop of St Albans and my mother would wryly comment that the maternity home was in Folly Lane, a very suitable name considering how many of the occupants got to be there. My cousin Christine, some nine months my senior, was born at Shardeloes in Amersham, a similar grand old house although our parents both lived in the same street, Priory Grove, in Stockwell. We lived with my maternal grandparents in a lovely old house, Montana Cottage. Grandad had been a master builder, from a long line of master builders who hailed from Hinckley in, what was then, Rutland. From the way Grandad spoke I assumed the family had come straight to Stockwell from Hinckley but in the 1871 census I found his father, Thomas Ireland, living at 3 Golborne Rd having moved there from Hinckley some time the previous decade. His marriage licence shows him marrying Elizabeth Hotter at St Martin in the Fields in 1858 and their first child, Thomas, was born in Kensington in 1860. My grandad was born in 1874 after the family had subsequently moved to Chiswick so would have been unlikely to have known and in any event died in 1948. Doing further research I found Thomas Ireland not only lived on Golborne Road but built and owned a large number of properties the west side of the Iron Bridge (somehow it always seems to ask to be capitalised!). In 1869 he made application to the Kensington Vestry for leave to lay stone pipeware at numbers 51-55,66-72 and 74-78 being premises to the west side of the Mitre Tavern and St Ervans Rd respectively. He is named as property owner and laying the drainage at his own expense. He also, in 1872, is listed as a discharged bankrupt in The London Gazette so I can only wonder what turn of fate reduced him from property owner to bankrupt. Thomas’ original buildings still stand. One of them “Clarkes” is owned by Reg Thackeray, a local identity, who has been very helpful and accommodating whenever I’ve turned up with questions and camera. We were fortunate in only having one other family with which to share the above shop accommodation. Others were very cramped, often with a family per room. Water heating and bathrooms were non existent. “However did you keep clean?” my children asked. On Saturday night the galvanised bathtub would be lifted off the wall in the hallway and lugged into the kitchen where it would be filled from saucepans and kettles boiled on the gas stove. I had the first, quick bath, then Mum with the addition of more hot water and finally Dad after some water had been ladled out and still more hot added. The rest of the week, in the words of my grandmother, one “Washed down as far as possible, up as far as possible and then washed one’s possible”. It is not hard to imagine how the phrase “throwing the baby out with the bathwater” originated when large families were all using the same bath. After several children had washed it must have resembled People Soup and one small body easily overlooked. Clothing was similarly washed in a galvanised tub with a wooden scrubbing board and a bar of hard, yellow Sunlight soap. No such thing then as a daily change of clothes although knickers were probably changed a couple of times a week and the crotch rinsed out and hung up to dry overnight. At most, clothing was washed weekly or taken to the bagwash on the corner of Golborne and Southam Street. Tony Roper’s play “The Steamie” about a group of Glasgow women using a communal washing facility gives an idea of what it was like although the bagwash took in your clothing and returned it to you later that day to be dried at home. Mum would load the bag on my pushchair and wheel it along the road then retrace her steps that afternoon. Frequently someone else’s odd sock or handkerchief would turn up amongst your wash or some item of yours would be missing which gave an element of anxiety to the proceeding. From inside the shop one could look out the back and see the vats of hot, soapy water where the laundry would be stewed into submission. Anything delicate was washed at home and hung on a clothes line that extended out the back window on a pulley system and was affixed at its far end to a pole rising up from the backyard. This worked well until the rope broke and everything tumbled down into the filthy yard and had to be retrieved and rewashed. But people kept themselves clean to the best of their abilities considering the appalling conditions in which they lived. Along our side of Golborne Road, just down from the corner with Kensal Road was a stationers’ that sold all sorts of fascinating types of paper – Bond, Antique Laid, Kraft, Manilla and Vellum to name but a few. I loved the smell and would find any excuse to go in and buy a sheet of fine silver tissue or lace paper. Looking at aerial photos I think this must have been number 3 where the Irelands lived but I can’t be sure after so many years. Next door was a sweetshop, Wardells, run by an old woman who was always knitting. A girl about my age, Gillian, lived with her but I’m not sure of their relationship. Sweets were displayed on an open counter for you to chose your own mixture. I’m ashamed to admit a friend and I would go in and ask the woman the time. To tell us she had to go out the back to see the clock and in her absence we’d stuff as many sweets as we could into our pockets. We were never caught but I’m sure she must have suspected. Gillian was a plump child with golden ringlets and elaborate , hand-knitted, lacy dresses. For some reason she never fitted in with the other children on the street and we’d tease her by singing “Fuzzy Wuzzy was a bear, Fuzzy Wuzzy had no hair, so he wasn’t fuzzy wus ‘e?” and tugging her hair. To fit in was crucial. When we lived in Stockwell Mum used to handmake my dresses with ruching, frills and smocking and my hair would be coaxed each night into ringlets with strips of rag. I attended tap dancing and ballet classes (and was useless at both due to a chronic lack of rhythm) I was so teased at Wornington Road school because I looked and sounded different from the rag tag children who attended that Mum had my hair cut into a straight bob and ran me up some plain gingham dresses that washed into shapelessness. My accent was still South London but at least I didn’t look obviously different. I only stayed less than a year at Wornington Road. As well as the bullying, the level of teaching left much to be desired. Mum tells me I went, at six, knowing my 6,7 and 8 times table and left having forgotten my 3 times table. I was enrolled at St. Mary’s Catholic School on East Row and flourished there. But more later on that. On the corner of Golborne and Edenham was a post office, either number 9 or 11 and across Edenham Street at lived Mrs Mabley with her children. There was also a family named Wilson who had children Dawn and Keith. I was friends for a short while with Ann Mabley and we would go to the Saturday morning Minors at the Prince of Wales cinema on Harrow Road. It was sixpence admission and I’d get another sixpence to buy sweets. Ann and her younger brother only ever got their admission money and an apple. I don’t recall there being a Mr Mabley. Number 15 was a tobacconist and sweet shop run by the Whites who had two sons Gordon (?) and Raymond about my age. Raymond had a bit of a crush on me and would sneak sweets to me when his dad wasn’t looking. 17 Golborne was also a shop down below. Its function varied as no-one ever seemed to make a go of it. The only business I can recall being there for any length of time was a secondhand shop that sold reconditioned electrical goods among other things. 19 was the premises of the shoe repairer Bert Cross and his wife Amy. They were unusual in that they were a childless couple and had the whole property to themselves. The other side of us, number 23, held three families all of whom were immigrants. The Gonzalez and Ramayons were Spanish and the Christis were Greek Cypriot. The Christi’s daughter Yannoula was to become my best friend during those early years and partner in shoplifting. There was a dairy at 27 run by a Welshman Dai Francis. His daughter married Kenny Ball’s bassist Vic Pitt and on a couple of occasions gave us tickets for a Kenny Ball concert. There was a friendly agreement between Dai and my Dad that Dad wouldn’t sell fresh milk and Dai wouldn’t sell meat or bacon although Dad did sell sterilised milk, a horrible tasting liquid that came in tall, narrow bottles with a crimped top like a beer bottle. As many people didn’t have a refrigerator it had the advantage of lasting somewhat longer than regular milk. Further along was a chemist run by an older man and his son. In my teenage years I had an after school job there filling bottles with some patent nostrum, iron tonic, which was a virulent red but much sought after. As I wrote previously, the bagwash was on the corner of our block. Across the road, at the Kensal Road end were several shops. One was a fish and chip shop but the proprietors were very surly and expected you to bring your own newspaper in which to wrap the fish and chips. We always preferred the Greek shop the other side of the Iron Bridge. On the corner of Hazelwood Crescent was the Prince Arthur pub. During the week it was pretty quiet but Friday and Saturday night was regularly the scene of fights. It was not only men who indulged in fisticuffs but women, particularly the local “toms” who had fallen out over a client. They would strip off to the waist and bare knuckle box, pull hair and claw at each other until either other customers or the police broke them up. This was weekend entertainment from the balcony seats of our first floor lounge. Mum and Dad always said it was better offering than what was on our nine inch black and white tele. At number 12, next to the Prince, lived the Howes and Higgs, a family named Fox and also Mr Fisher with his daughter Joan and teenage son David. Joan was to be come my Mum’s best friend despite a fifteen year gap in their ages. She worked as a cutter at Marks & Spencers in the days when British Made meant exactly that and they had their factory in Marylebone. The three Gs – Greens, Gethings and Gibsons were at 16 but I can recall nothing about them. (there did seem to be a curious alliterative chance as to who lived where on that side of the road!) Among others at 18 were the Digweeds, an established local family and the Doyles. Also the Healeys with a son John, a couple of years younger than me. We met up through Friendsreunited some years ago and it is to him that I owe a lot of this information. Number 20 on the corner with Appleford Road was a doctor’s surgery at ground level and lodgings for several single men on the upper floors. From their names they seem to have been Irish. The Powers who lived in the basement were Irish. Mrs Power was the doctor’s housekeeper and their daughter Kayleen was also one of my friends. The other side of Appleford Road was a closed shop that was used as a workshop by a bespoke tailor. Above it lived a Polish (I think) couple with a daughter Juleika. I think they were refugees or DPs. Juleika and I were friends until one day she refused to return a book I had lent her. It was a very old one about cats (illustrated by Louis Wain from memory) and one of my favourites. I came home wailing and Dad went over to see her Mum but was told she wouldn’t make Juleika hand it back as “Gwen has so much and Juleika has so little” At a distance of sixty years I can see the logic in that but not at the time and I never spoke to her again. Forgiveness is not one of my virtues. Gwen Nelson (nee Martin), 2014. This entry was posted in Golborne, Schools, Shops, Streets and tagged 1950s, Appleford Rd, Clarke's, Edenham Street, Golborne Road, Kensal Road, Prince Arthur, Southam Street, Trellick Tower. Bookmark the permalink. Amazing, thank you very much. so much Gwen. I enjoyed all you had to say. I lived in southam st; until 1963 .interesting article. Born and raised in the so called rough end of Southam St was to me a fantastic chance in life.My feeling is that if you can survive and succeed having come from the area of Kensal Town,you haven’t done too bad.I have very vivid memories of the 40s and 50s.The amount of places to[ play out ] at Bombed sites or Debris as we called them,the Grand union Canal just over the road.Jumping off Tower Bridge,swimming in the cut at The Gas Works.Boys clubs and girls everywhere,dancing.boxing,table tennis football and cricket in the streets,Race Riots.Dice and card games in the street.LKatger the clubs of Bayswater and the Jazz clubs in the west end indeed much more. Should of course have read Carlton Bridge at the top end of Kensal Rd and Gt Western Rd. I went on to train as a nurse, social worker, read a BA in Mediaeval History and on retirement trained as an artist and am also doing ESOL teaching. Not bad for a little girl from The Golborne! Girls from St Mary,s used to come to Brunel in middle row to use our top floor kitchens for cookery lessons.Some of us used to hang around the back stairs to see them and chat them up,All good fun. St Mary’s was actually in East Row,nearly opposite the lovely little park.I still often visit the area,bit of a magnet freally,I was at Brunel Boys school 1950/1954.I was the school captain in my final year.One of the rarities,I loved my school days.Brunel was a great school for sport. Yes you are quite correct. East Row it was. I’m currently working on my blog about First Holy C5av8vwommunion at Our Lady of thr Holy Souls in Bosworth Road. Did you know it was the same atchitect as built Westminster Cathedral. Would you remember the Carters? There was a girl Christine and a boy Billy. We emigrated to New Zealand in 1967 and Dadhad a shop there too. One day Billy Carter came into his shop there. He’d joined a circus as a labourer and it wastouring NZ. Small world eh! I know what you mean about having succeeded if you came from Kensal. I always felt very inferior at high school because most of the othergirls came from affluent professional families from Richmond or Putney. I went on totrainas nurse, social worker, have a BA in Mediaeval History and now work part time as ESOL tutor sohavwn’tdone too badly. LOL. His name was Andy Berryman and he was Jewish. He also had a daughter named Simone. John Hiscott lived at 82 Walmer Road and I lived at 92 Walmer Road (my brother-in-law’s house, George Hill) from 1956-63, opposite Jarvis Garage. Michael Bartlett and his sister Diane, David Maughan (who I worked with at Moo Cow bakery), a young office girl Marian Ashton (who had a sister Pam) and Barry Cheese (Fowell Street). A corner shop called Cannons, Fitzes and Burt English Dairy’s. I live in the outskirts of Bangor, North Wales. Hi William, thanks for your reply. Can I admit to being a little confused as to where your answer fits in the thread. I can’t remember Andy Berryman being mentioned at all. I lived in Kensal Road from when I was born in 1953 until 1966 so it might seem like a world record act of procrastination that I didn’t get round to going back until December last year when I stood at Hammersmith station, had an hour to spare and thought ‘why not?’ Actually, it wasn’t procrastination. As we were moving to Croydon in 1966, I made a conscious decision that it was going to be impossible to maintain my old friendships and, a few years later, I was aware that everything I knew between the canal and the railway had been bulldozed so there seemed no point in going back although I got as close as Harrow and Portobello Roads on several occasions. A conversation about my visit over Christmas with my brother led me to check a few facts on the internet as you do and, in the process, I was blown away to find your blogs on Golborne Road. Almost unique to find anything at all about the area I remember on the vast internet, it filled in some long forgotten memories of names, shops and places and more than a few things I didn’t know about the area. I can definitely remember, though, that my mother was a regular in your father’s shop and that photo of him behind the counter could almost have been printed from my memory. I know that he was a serious stamp collector as he very generously gave me a large quantity of old British and Colonial stamps in a folder, which more than supplemented my meagre schoolboy level collection. He also gave me a few old Stanley Gibbons catalogues, which I pored over, cross referencing the stamps he had given me. My stamp collecting days gave way to other boyish pursuits and the catalogues are long gone but I still have those stamps. It was such a generous act that I often thought about why he would have done that and, although I will never know for sure, it’s possible that, as my father lived in Silesia before the war and before joining the British Eighth Army and subsequently immigrating to the UK, there was some kind of connection between your father and mine. Thanks also to Richard for memories of St Andrew’s School, where I went from 1958 to 1964. Apart from Mr Martin’s stamps, I still have a couple of book prizes from that school. I remember being quite bright compared to most children in my class, so my parents were devastated when I failed my eleven plus. If the exam had included any subject other than maths, I would have passed but I couldn’t recite my tables or add up a column of numbers and get the right answer if my life depended on it. I remember my father did some mysterious work in the background to get me a place at North Paddington school in Harrow Road instead of Wornington Road. In case you haven’t seen them, the late Roger Mayne photographed the area, especially Southam Street, on a regular basis in the 50s and a lot of his photos are available online and in various publications. Over the last couple of weeks, while sorting out my disorganised collection of photos, I came across a few prints and negatives of the area in the early 60s and I probably have my own story to tell, which I’m happy to share. If it’s of interest, maybe someone can let me know. Would be great to see some old photos of w10 I now live in sutton maybe a pint a chat let me know. Hi Derek – I’m getting round to writing a piece for the website and I will submit some photos at the same time but work is getting in the way at the moment. Happy to meet up and bring some photos, I’m in Sevenoaks now so not far away, maybe meet halfway, say at the White Lion in Warlingham one midweek lunchtime? Roger, what a lovely tribute to my Dad. He would be delighted to know you still have the stamps. I’d love to see any photos you might have but am living in Scotland now. Did you know there are a couple of Facebook pages “Born in W.10” and “Nottinh Hill and North Kensington” photo archive. They’d probably be very interested too. Thanks for the tips re Facebook, Gwen. As you saw yesterday from my post there, I’ve been let into the photo archive although I’m still waiting for ‘Born in W10’. You may also have seen that I put up a post of my own on this website a couple of weeks ago. Those lost memories have been coming back and I have enough for another post, which I hope to finish, with some more pics, in the next week or so. If only I had realised about the girl in Wardle’s, I wouldn’t have waited so long to be served, I could have helped myself. It was always a toss up who was slower, Wardle’s or Ada Smith’s in Kensal Place as I’ve written in my second post, which should see the light of day soon. I was wondering if when you said Ada Smith you meant Ada Tyne? My Nan and Grandad owned a newsagent there. They were Mary and Horace Smith. He rode a bike everywhere with one leg and when he died Alf and Ada Tyne ran the shop. My family moved to Finchley from there and they had five children who all did the paper rounds and my Grandad used to stand outside Rootsies selling the Evening Standard. I wondered if anyone in your family remember them ? I did mean Ada Tyne, Lynn. I might have been in too much of a hurry when I wrote this blog as I’ve found a few errors reading back as I’ve remembered more over time and it reads to me now more like an exercise in how childhood memories get distorted over time. I don’t remember anyone in the shop before Alf and Ada though I’m afraid. Both the old lady and the little girl were a bit slow. We were all pretty mean to her. She was a plump girl with beautiful golden ringlets and her grandmother (?) used to knit all her clothes. And I mean ALL!! We used to tease her a lot and call her “Fuzzy Wuzzy” because of her hair. I remember one time the park keeper at the Little Rec intervened and made us all leave the park because we were being so nasty. Try as I might, I don’t remember the girl beyond them being incredibly slow in there. I’ve managed to recall quite a lot in the last few weeks but I don’t remember where the little rec was or what was in it. I think there was a big rec too. Could you let me know? That might jog a few more memories. The “Little Rec” was what we called the “Emslie Horniman Pleasance” near the Catholic church on Bosworth Rd. It was/is a very pretty little park. Used to walk through it from Golborne Rd, up Appleford on my way to school at St. Mary’s East Row. I don’t know what the “Big Rec”was or even if there was one. Thank you Gwen, I only found it’s correct name in the last few weeks and I must have called it something at the time. ‘I say mater, I’m just popping to the Emslie Horniman Pleasance with my pals’ probably isn’t the kind of language I would have used at the time. I think I’ve nearly exhausted all the memories that are going to come out so I’ll be ready to launch part 2 of my post soon. ROFL I could just imagine a North Kensington response to that statement! I only found out its correct name when I was down there middle of last year. Always was the Little Rec. I remember the park keeper Mrs Oliver, around 1946. Lovely lady. I was at Middle Row ie Brunel around 48 to 53 …. real proper teachers. The big rec was in Paddington. Hi Mick, since I wrote this I’ve travelled back a few times to W10 and met up with a few of my old friends and, although I can see what you mean about Paddington rec, as we rarely crossed the canal, I think the big rec was St Mark’s park. It’s nearer to the Golborne area than Paddington rec so would have been the next nearest green space. shows the premises in a very poor condition. Like so many houses, in this section of the street, there were rooms above the shop – but who lived in them and who worked in the shop? Do you have any memories or recollections related to this business? They may have owned a small green Golden Shred(?) van, which presumably, would have been parked outside, adjacent to the shop, in Edenham Street. I have found it quite a challenge to discover more about the history of this firm, during their period at Golborne Road and would be keen to know if anyone can provide any information, memories or pictures. Hi Michael, that’s very interesting you are researching the history of Timpo Toys. Many of us remember their various premises around the area at the time buy not necessarily to your level of detail, although no doubt Gwen is best placed to talk about their premises in Golborne Road. As and when you complete your research, if it becomes available in the public domain in whatever form, would you please let us know on the Old Notting Hill and North Kensington History (Facebook) Group? We have more than 4,200 members who are very interested in all things NHNK. Good luck with your research! Hello Roger. Thank you for your positive comments – and suggestion of joining the Old Notting Hill/North Ken History (FB) Group. A request has been placed today! I would be particularly keen to see if there are any members/local residents who have any memories of the firm, during their time in Notting Hill/North Ken area. Interestingly, Model Toys Ltd were also at 275 Kensal Road, from 1958 – 1964 and in a previous incarnation (As Toy Importers Ltd) in premises; Westbourne Hall, 26 Westbourne Grove – 1938 to 1946 and 45 Devonshire Works, Dukes Avenue, Chiswick – 1949 to 1953. Which makes for lots of interesting research! Hello Michael, thank you for your positive comments. I’m sorry but I don’t have any information about the Timpo business but I think someone mentioned it a little while ago on one of the Facebook pages. There are a few that deal with local history in “The Notting Hill and North Kensington Photo Archive” and “Old Notting Hill/North Ken History Group” plus “Born in W.10” which is more social. I checked the 1952 electoral rolls and there was no-one living above number 11 in 1952. People next door at 13 were Hilda Mabley whose daughter Ann and I used to go to the Saturday morning Minors at the Prince of Wales cinema on Harrow Road. There is also a William Blake and a Rudolph Wingate listed as living there at the time. Sorry I can’t be of any more help but you may be able to find something more in one of the aforementioned groups. Thank you Gwen. Yes, searching for information can be both challenging and exciting at times and the research road can bring along new perspectives and ideas. Thanks for your suggestions – I shall follow these up. Do keep writing, I enjoy reading your posts and have learned a great deal about the former times on Golborne Road. A very vibrant and lively community. I was at St Mary’s RC school in East Row from 1943/1951. I lived in the flats on Kensal Road and West Row. Then I went to Cardinal Manning RC boys in West 10. I now live in Luton. When we moved to Golborne Road I was at Wornington Road from 1952-3 then my parents transferred me to ST. Mary’s where I toook my 11 Plus and went on to the Sacred Heart at Hammersmith in 1957.